I wish I could tell you we could create an excellent website design for you, and it would last until the end of time. But the internet isn’t the Pyramids of Giza or the Roman Colosseum. Things change rapidly online: technology, trends, devices. 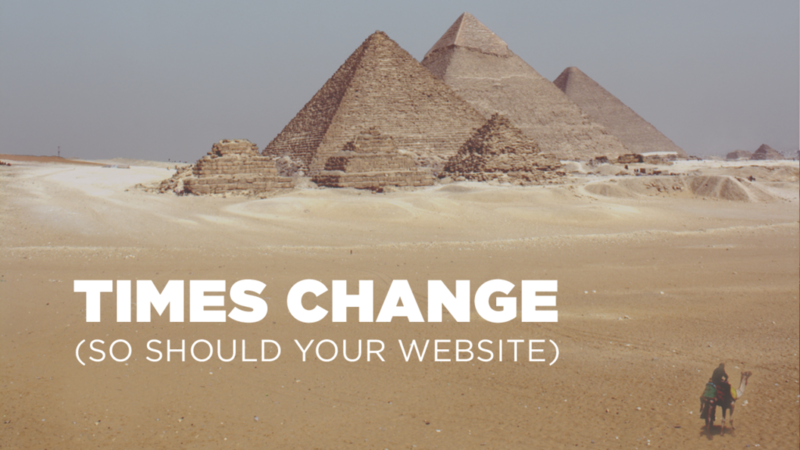 Your website needs to adapt to keep serving you. How often do you need to adapt and change? We counsel our clients (and even provide client discounts!) to consider a website redesign every three years. This is due to a few key factors…. I recently received an email from a client asking about adding a few features to his website’s home page. As a beer distributor, his product offerings had shifted to include more local and regional products. He wanted a way to highlight new craft beers and limited releases. How long had it been since we launched his website? Almost 3 years to the week. I bet the same is true for you. In most businesses, you don’t keep your products or services exactly the same for decades. You need to make sure your website always reflects who you are and what you offer. As part of a third-year website redesign, we go back to square one to plan your content around your business’s current offerings, mission, and target customer. As your business and your offerings adapt over time, you may be targeting a new or slightly different customer. Or, even if you’re targeting the same customer, their situation and challenges may change over time. It is critical that your website always speaks to your target customer. The text on the website needs to be reviewed and reconsidered to make sure it is always addressing the customer’s current challenges and your solution. Remember when websites all played background music? In very early website design, designers thought this helped create an immersive experience. Now, it’s just annoying. As with background music, trends change. After three years, design trends can change significantly, and you and your business can look behind the times. There is no doubt that new devices will be introduced during your website’s life cycle. People will be viewing your site on dramatically different screens three years from now than they were when the website was designed. When I first started 11Web and designed our first few websites, almost no one was using an iPad for web browsing. I designed for computers and one size of smart phones. Today, we have to design and code to accommodate huge desktop monitors, laptops, iPads, small tablets, large smartphones, and small smartphones. A regular redesign will keep your website up to date with viewing and screen technology. This will make sure that your website always looks impeccable and no visitor has a bad experience. I can’t stand hackers and spambots and evildoers. Unfortunately, they are out there, always getting more crafty. We keep an eye on security threats, and we use code and technology to keep them out of our clients’ sites. However, when we create a site, we can only know about the threats that already exist. As time goes by, it is usually the older sites with older technology that are hacked most often. Hackers exploit vulnerabilities that lie in old code that hasn’t been updated. Even if you don’t care about design trends, redesigning your site every three years has a final benefit of keeping your site and your visitors safe. We can update the code and avoid security vulnerabilities. Redesigning your website every three years keeps your investment running smoothly and working for you. Have a website older than three years? We’d be happy to review it for outdated design, device viewing issues, and security issues for free. Click here to schedule a free website review. Sara has been a code junkie since junior high. After many hours reading tutorials and learning about code, she plugged in the ‘ole dial-up modem and created her first HTML-based website for her Girl Scout troop. It took several years, a degree in International Business, and a short-lived career in distribution before Sara realized her true passion was still behind a computer. Sara loves collaborating with businesses and organizations to take the fear and frustration out of the internet. With her business background, Sara has the expertise to help clients pinpoint their primary audience and target communications to best reach that audience. She then transforms this strategy into a profitable and easy-to-navigate web solution designed to get results. When she’s not hiding behind her beloved MacBook Air, Sara can be found running, golfing, and traveling (with her laptop, of course! ).